Join us on November 9th for a two-part event celebrating the poetry of Lucille Clifton and the teaching of poetry with Michael Glaser. FREE – requires advance registration. Michael S. Glaser leads English and language arts teachers in a poetry workshop inspired by the work of Lucille Clifton. Some participants will read at the evening event. Lunch served. Space limited and registration is required. Former Poet Laureate of Maryland, Michael S. Glaser was a longtime friend of the late Lucille Clifton. A recipient of the Homer Dodge Endowed Award for Excellence in Teaching, Glaser has also received the Columbia Merit Award for service to poetry, and Loyola College’s Andrew White Medal for commitment to sustaining the poetic tradition in Maryland. Glaser served as a Maryland State Arts Council poet-in-the-schools for more than 25 years. He is the author of several books of poetry and an editor of two books on Lucille Clifton. 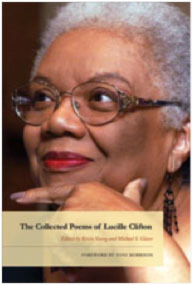 Beloved poet and national treasure Lucille Clifton was a HoCoPoLitSo board member until her passing in 2010. Along with Carolyn Kizer, she was the first poet to read for HoCoPoLitSo, in 1974. She was a National Book Award winner and two-time Pulitzer Prize finalist. Free. Limited seating. Advance reservations are requested at lucillecliftonpoetryseries.eventbrite.com. A presentation of HoCoPoLitSo. Co-presented by Delta Sigma Theta Sorority, Inc., Columbia, MD Alumnae Chapter. From “telling our stories” by Lucille Clifton, from The Collected Poems of Lucille Clifton 1965-2010. Used by permission of BOA Editions. By hocopolitso in Lucille Clifton Reading Series on September 23, 2013 .